Which is the bigger mess? The Economist spoke of a "perfect mess". Was that the Bundestag or the small-half-donut-inside-a-big-half-donut mess? Presumably, it was something about the distribution of seats that so disturbed our esteemed editors but the reader is unlikely to empathize based on this chart. One will be mistaken to think the size of the Bundestag doubled from 2002 to 2005; in fact, it only grew by 10 to 613 seats in 2005. In the chart on the right, the gains and losses in seats by each party are made front and center. This is a good chart if seat changes are the key message to be conveyed. Lying hidden in this presentation is the fact that the two largest parties has continued to dominate despite losing some seats to the small parties. Again, I turn to the Bumps chart. Here, both the relative sizes of each party and the gains/losses are clearly depicted. It is also easy to read off the rankings by number of seats in 2002 and 2005. 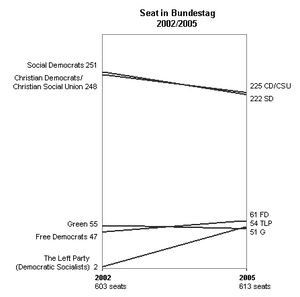 For instance, the Christian Democrats overtook the Social Democrats in 2005. The Left Party enjoyed a spectacular rise while the Greens suffered, becoming the smallest party, even though it lost only four seats. The total number of seats is also included without clutter. At long last, the so-called mess is evident in the criss-crossing lines, indicating that the ranking of the parties was turned topsy-turvy in the recent election. Reference: "A system in crisis, a country adrift", Economist, Sept 22 2005. Thanks to Annette for help with this post. Time-series data is tricky to deal with: indeed, an alarm bell should be set to ring every time we see a graph containing few sampled times (in the working hours chart, we were shown two times: 1990 and 2004). What happened during the intervening 14 years? one wonders. Regarding the outlier for Japan 1990, one asks if it is an outlier in time and country or just in time. At first sight, the choice of two sampled times has not distorted the picture much. The general trend (downwards, and clustering) remains intact. The blue segments are periods of increasing work hours; the red, decreasing hours. This reveals the temporal pattern. 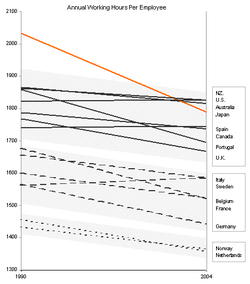 Between 1998 and 2002, working hours decreased in most countries (except Spain and Belgium). However, for 6 out of 15 countries, 1994-8 represented a period of increasing hours. These six included U.S. and five European countries. 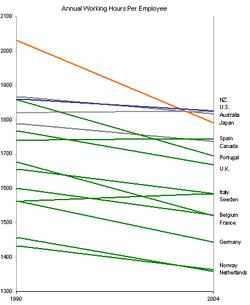 Besides, the steepest decline were achieved by Japan, Portugal and the Netherlands in 1990-4, and by France in 1998-2002. 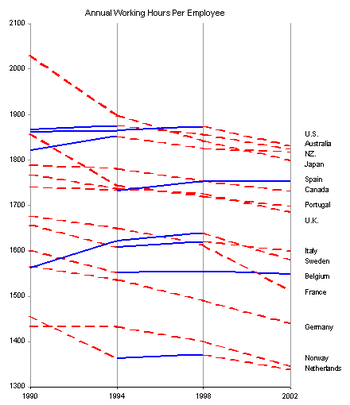 The steepest increase was by Sweden from 1990-4. Half the countries experienced at least one 4-year period in which working hours increased. The average number of hours worked each year has been falling in most rich countries over the past 15 years. In 2004, the Japanese worked 12% fewer hours than in 1990. Most Europeans have also been working less: 10% fewer hours in France and 6% fewer in Germany. Americans and New Zealanders toiled the most in 2004, while the average Dutch worker put in around 25% fewer hours than his American counterpart. This sort of paired bar charts is frequently used in cross-tabulations of data (here, cross-tabulating country by year). I find charts like this one confusing. For example, the last point comparing U.S. and New Zealand requires visual comparison of two bars which are separated by 25 irrelevant bars. Moreover, because the countries are arranged in order of increasing 2004 working hours, it is difficult to verify the statement about European countries. The junkchart version below is modeled after the Bumps chart (here, here and here), except that the vertical axis is measured on a continuous scale rather than as ranks. The relevant countries are color-coded to help the visual comparisons: U.S. (blue), Japan (orange), Europe (green), others (grey). From this chart, we further note that despite a general downward trend, there was variation between the European countries. While most countries reduce working hours slightly, at least two European countries appeared to have increased hours. Further, excluding Japan, the bunch of lines drifted down by less than 10% over 14 years. One secret of this chart is that it takes advantage of both vertical axes, plotting two data series measured on the same scale. Thus, this chart does not emphasize 2004 hours at the expense of 1990 hours. Based on this chart and 1990 hours, we can find three clusters of countries: those working over 1700 hours (NZ, U.S., Australia, Spain, Canada, Portugal, U.K.); those working between 1500 and 1700 hours (Italy, Sweden, Belgium, France, Germany); and those working fewer than 1500 (Norway, Netherlands). Japan could be considered an outlier in 1990 but it re-joined the hardest-working cluster by 2004. The lines within each cluster has drifted down slightly from 1990 to 2004 but no member country strayed from its cluster (but Germany may be the first to do so in the next few years). The chart on the right makes this cluster structure clear. Based on previous commentary, some of you will want to see more data than just the two years. In the next post, I'll take a look at what further insights can be attained if we had more data. Reference: "Working Hours", Economist, Sept 22, 2005. Another purpose of data graphics is to tell stories, and Wall Street Journal printed one such chart recently. 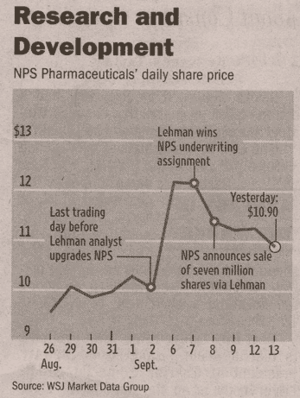 In this chart (left), the annotations providing a plausible explanation for the ups and downs of NPS' share price are crucial pieces of information. Together, the words and the line form a strongly suggestive indictment. Note the use of unequal time intervals: weekends and the Labor Day holiday were omitted because the stock market is closed on those days. The practice of using unequally sized intervals to represent equal chunks of time is highly distorting and inexcusable, so this special situation should be footnoted. Taking out the axis/grid-line architecture, this graph would look simpler and better if the share price is given after each annotation, and at the start and end of the plotted time period. The title "Research and Development" makes no sense to me. I also wouldn't use "yesterday" which presumes the reader looks at the chart on the day of publication only. Reference: "Timing of Stock Issue Questioned After Upgrade", Wall Street Journal, Sept 14, 2005. Mahalanobis had a nice post on what he calls the "omitted variable bias". His main point is to use regressions with care. Although he didn't say it outright, the post also suggests using scatter plots with care! This topic is sometimes called "co-variates". These are variables that are not under study but are correlated with the outcome variable and thus need to be accounted for in the analysis. Scatter plots help determine which co-variates affect the outcome. To further complicate matters, co-variates may also be correlated with explanatory variables. Such "interaction" between variables is evident when the two regression lines are not parallel. A few of us were having a lively discussion about the "start-at-0" rule recently. The "start-at-0" rule says that the vertical axis of any graph ought to start at value 0. 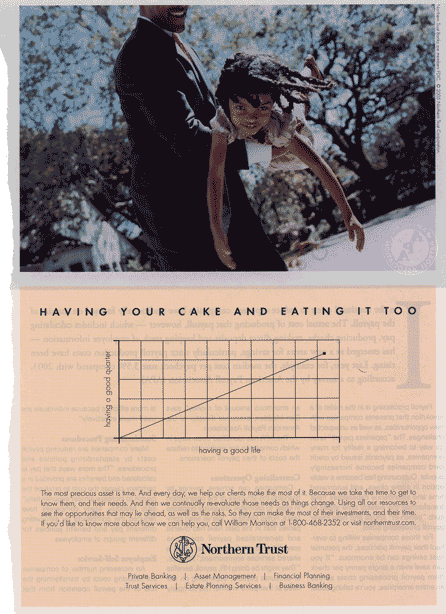 The rule was mentioned in Huff's classic booklet, "How to Lie with Statistics" : as the name implies, the rule is intended to eradicate mischievous graphs that exaggerate small differences by not starting at 0, which is to say, by choosing a misleading scale. Others, like Tufte and Wainer , have long realized that the start-at-0 rule is not absolute, and we essentially re-discovered this in our discussion. My own "anti-rule" stipulates that if all data appearing in a chart are far from 0, then don't start at 0. Note the spectacular plunge from $8 billion to under $1 billion in 2005. Unlike the Civic sales chart, here they picked a long time frame and started at 0, allowing readers to visualize the remarkable trend. In the junkchart version below, I touched up a few things. Shading the area highlights a feature that carries little useful information so I removed that. Instead, the breakpoints on the time-line and the annotations should identify the inflection points on the curve. Also, it is important to cite the starting and ending dates since they don't fall in Dec/Jan. 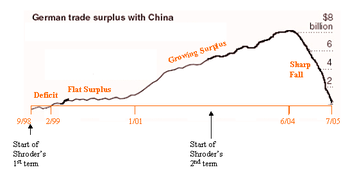 Finally, a question for the economists: why did the original graph say "12-month surplus"? It seems to me that they plotted the trade surplus/deficit at the end of each month from Sept 98 to July 05... The text actually said: Germany's trade surplus with China peaked in the summer of 2004 when the 12-month total was $8.1 billion. I'm confused. Reference: "A Bright Spot in Germany's Economy Seems to Be Fading", New York Times, Sept 17, 2005. The Northern Trust advertisement is a great instructional tool, and Michael Anderson captured its key aspects in these comments. Michael, by the way, has an interesting blog too on teaching statistics. Gridlines, choice of scale, dependent and independent variables, data-ink ratio, linear interpolation, sample size are all issues raised by the chart. While we can't expect advertisers to be rigorous about charts, it is appalling to see the total neglect of all of these issues. A "graph" from an advertiser in a business magazine. Feel free to add a comment below. Since the purpose of data visualization is to reveal insights, a chart that hides its message is bad; the reader can recognize a bad chart within seconds. 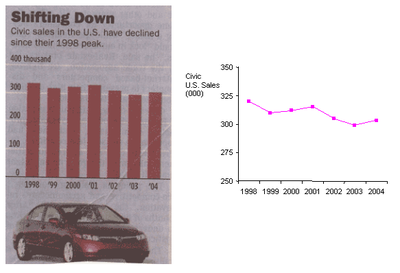 While the caption informs us that sales of Civic cars have declined since 1998, this message is buried in tall and thick bars that are similar in height, the downward trend not at all obvious. Possibly, the designer is taking advice seriously; I'm sure a guru or two has written about it, that honest chartists start the vertical axis at 0 so as not to exaggerate small differences. This tip is somewhere in one of these seminal books, by Tufte or by Wainer . However, for this chart, the difference is the message, and starting the axis at 0 serves to hide this message. The junkchart version fixes the vertical scale and instead uses a line chart. The downward slope is now clear but we also observe that sales have fluctuated over the years. Prof. Gelman, a sometime visitor here, also has also suggested that line charts are often more effective than bar charts. Reference: "Honda, in a Funk, Tries to Revive the Civic's Virtues", Wall Street Journal, Sept 9, 2005. Here's a chart to delight those seeking teaching materials. The chart summarizes responses to two questions in a marketing survey about "storage virtualization"; it came from an IT publication, for those of you wondering. 1. "Hide the message": it would appear that these two questions were posed in order to understand which benefits/pitfalls potential customers would consider "most important", "important" and "not so important". This information is squeezed to the side of the page, turned vertical, and written in black font that is totally overshadowed by the brightly-lit bars. 2. Chartjunk: Tufte would have a field day with this chart. Those vertical gridlines are utterly useless as the value for each bar is provided. Drawing in gridlines without a scale compounds the problem. The reader needs to guess that the survey probably asked respondents to rank each benefit/pitfall from least important (1) to most important (5). Besides, the choice of color is inexplicable, taking attention away from the key message. 3. Carelessness: the bottom chart is unrecyclable junk: the printed numbers do not match the lengths of the bars! Take the last set "Technology too immature": the red bar (3.34) is shorter than the orange (3.19). Thus, we have to throw out the bottom chart. Even then, a careless mistake like this destroys the graph's credibility completely. 4. "More is Less": this often happens when data get divided into segments without revealing much insight. If we are to be shown large, medium and small businesses separately, we should be able to easily pick up differences between the three segments. Looking at the top chart, I observe that almost every rating is between 3 and 4, regardless of size of business. The key message can be reinforced if the three segments are combined into one. When studied more carefully, one can see differences in ranking of the benefits across segments. But these bar charts obscure rank information. In fact, for this data, the relative ranking of the benefits is probably more meaningful than the actual ratings and so even the metric has not been chosen judiciously. This pair of charts should have been left on the cutting room floor. Ironically, they appeared in the inaugural edition of what was heralded as a new beginning for a magazine. This was a magazine I thought was the best in the computer networking industry. They need a good graphics editor, presto! Reference: "Virtual Necessity ", IT Architect, Sept 2005. PS. It appears that the mistake in the bottom chart has been caught, after the paper version went to print, as the on-line version of the graph does not contain the error.